For those of you who want to upgrade your Samsung Galaxy Note 3 to the latest Android 8.1 Oreo, you are in luck as there is a stable version of Lineage OS 15.1 ROM that you can run on it if you have one of the models supported. While Samsung has stopped updating stock firmware since Android 5.0 Lollipop, you can still grab the latest and best Android 8.1 Oreo and easily install it. Now, this is an AOSP ROM(What is AOSP? ), meaning you won’t be able to get any TouchWiz apps (Samsung apps that depend on Samsung firmware). As far as the S-Pen goes, it still works you will just have to use a 3rd party app(such as Squid) which work just the same. In my testing with the SM-N9005 and T-Mobile SM-N900T models, I was able to get everything working including calls, text, 4G LTE, bluetooth, and more. The only thing seem to not work currently is NFC. For camera, everything works if you use the FootEj Camera from the Play Store including 4K video recording. Performance seem to have improved a TON with Antutu Score near 70K, which is 20-30% boost from stock firmwares on the Note 3. Battery life is also very good. 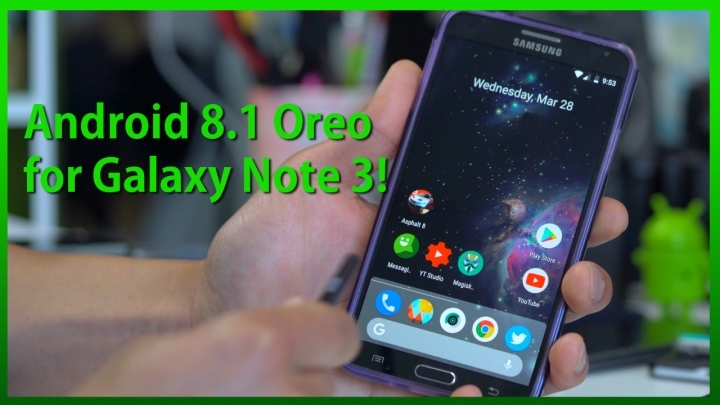 In fact, there’s absolutely no reason to not upgrade your Note 3 to Android 8.1 Oreo. Perhaps you have a Note 3 laying around in your house. This is an awesome ROM and we are just starting. I should have an update in the future but for right now, highly recommended. Please put your phone in download mode, use AP section of ODIN, and flash this TWICE. If your phone calls don’t work and you don’t see latest modem above, try checking XDA forums for latest one. For most part, Lineage OS ROM 15.1 is not bad for daily driving. If you experience any problems, we do highly recommend you to try Lineage 14.1 based on latest Android 7.1.1 Nougat. If you are interested in a review of the Nougat version(which is flawless since it has been around for awhile), please do leave a comment below and I will get a quick review up soon. Credits – XDA <— Please donate to the developers or hit the Thanks button on XDA if you like this, thx! Q: Bluetooth calls are not working! A: This may be a bug on some of the models. If you absolutely need bluetooth, you may want to try an Android 7.0 Nougat-bassed ROM instead. We recommend Lineage OS ROM v14.1. Q: When will bugs be fixed? A: Usually within 1-3 months after release of Lineage OS ROM, many bugs will be fixed and we will have a full update when more bugs have been fixed. For right now, this is still an experimental custom ROM. Q: Is this the only way to get latest Android 8.0/8.1 Oreo firmware on my Galaxy Note 3? A: Yes, since Samsung has officially stopped supporting new firmwares for Galaxy Note 3, your best route to get the latest Oreo is through custom ROMs such as this. But if you want full stability, we recommend going with Android 7.0/7.1 Nougat for now as they have been around for much longer with no bugs. Max, did you check if the GPS is working. You ROCK, Max!! Your video and this page were a lifesaver! However, the GPS on my hlte Samsung Note3 SM-N9005 does NOT work, I don’t even have Location in my settings… Could this have anything to do with my having to install OpenGapps-ARM-8.1 (the Beans version did not work at all and this phone is ARM, not ARM64)? My speedometer is broken so I DEPEND on the GPS as a speedometer. Is there somewhere that I can install the GPS like I did to get the modem working? Please enlighten me, ANY advice is appreciated! You are the BEST! I don’t believe bluetooth calls work, do they? No meu, nem reconheceu meu fone Bluethooth da JBL. Não sei o que faço. Reconheceu outros aparelhos, mas meu fone nada. Anybody having trouble getting past the “Welcome” screen? I’m tapping the four corners and not getting to the Lineage home screen. I was able to get pass the “Welcome” screen. Like you said, the taps on the corners have to be quick! Also for anyone installing this ROM and wants root, install Lineage and the G Apps first through TWRP, then setup your Google account. Once your Google account is setup, restart your phone and then press Volume Up, Power Button, and Home Button to log into TWRP. From there install Magisk v16 (or the latest version, if you’re seeing this post in the future), reboot to system. Once back into the Lineage 15.1 home screen, you’ll be rooted. Thank You very much, Eden, for this advice about Magisk V16 installation sequence. Hi Max, if you are able to use BT-calling … which headset brand are you using? dont think bt calls work. Lo instale en un n900v, con el firmware de tmobile, instalé el firmware luego las gapps. Lo inicié, metí mis datos de Google. Luego lo reinicié en recovery e instalé el magisk y perfecto , no tengo ningún problema, todo le funciona, muchas gracias. Good day Max. Do You know what for exist: “Settings”–“Display”–“Advanced”–“Advanced display”–“Accessibility mode”–“Screen curtain” в Android Oreo 8.1??? I select it and screen became copletely black!!! Only comlete Odin reinstallation solve this problem. Please tell what for this mode and easy way to reset this display option. I would advise not using that feature for now. Perhaps a bug? Good day Max. Thank You for fast responce! I have Note3 SM-N9005 (hlte). GPS does not work 🙁 No sattelite could be detected by special Apps or Navigation Apps. Also battery drain extremely fast. That could You advise in this case? Kostyantyn, did you ever find out what causes this? or better yet how to fix it without re installing the ROM. I unfortunately got nosy and clicked on that setting as well. According to your model dowload LATEST file form haggertk (for my model SM-N9005 hlte) this is lineage-15.1-20180506-UNOFFICIAL-hlte.zip From 5 may 2018! After that do everyfing according Max instruction only just use this file. If you already install latest modem (like me by previouse attemts to install Linage OS with Android 8.1) it is no nessesary to reinstall it. Android installation go like on the new phone from box, no any wellcome screen problem etc. Follow advise of Eden in this comments with Magisk installation. GPS navigation working good, NFC slowly, hardly but very good that it work at all 🙂 also it is looks like not consume power. First read the comments NO PRESS to SCREEN CURTAIN ))))) Only comlete Odin reinstallation with PC and new TWRP and ADVANCE WIPING MODE use solve this problem. A T T E N T I O N : with advance wiping you should wipe system also but BEFORE DOWLOAD SISTEM FILES ON EXTERNAL SD card of your mobile. Actually follow instruction like on this video after you install TWRP. Google camera (recorded video file savings) also working without any problem so no need to install FootEj camera. So Max Lee You can record new YouTube video. Please help me. TWRP 3.2.1 isnt loading on my note 3. Only the 2.8.7 version works. Any fix??? Flawless install, but after poking around in settings >display>advanced>accessibility mode> screen curtain. Please do a review of android 7.1.1 nougat on note 3! I would really appreciate that. And has anybody tried device encryption? I have heard there might be issues with LineageOS. everything working perfectly except my mobile data network, i have the default from my service operator but cant still use the internet. Play Store seems to be not installed right after I successfully upgraded my phone, HELP PLEASE. also got problems with play store…model SM-9005. Just download link above, and newest on mindgapps site. And used open gapps but no. Hi there , I could not find my model number in anywhere (SM-N9000Q) . I am trying to give a second chance to my old note 3 here, any help counts. thanks. Hi there! I have a problem, I was able to install oreo no problem and have no issues… Except that I can’t connect to wifi and don’t have cellular. any ideas as to why? and how I can fix this issue? best regards. Please do the review and install of Lineage 14.1 based on latest Android 7.1.1 Nougat. Thank you so much dude! Huge money saver. Works perfectly. Can anyone help me with this? I am completely new at this, & just wanna update my old Note 3 so my dad can use it. I’m voting for this question too as I’m on a Note 3 SM-N900 (International model – Malaysia) too, hoping for your response to whether can this ROM works on it? Tqvm. My network does not connect. I already installed the Modem, but it did not solve. Someone with the same problem? N9005 here !! but I see this error message : signature verification failed . Is there an update for Samsung Galaxy Note 3 SM-N900 ? Is there any Rom for unlocked note 3? galaxy note 3 N900L no signal, i can use SM-N9005 latest modem? Hey MAX, thank you so much for this awesome update for my note 3.. Just one thing, after updating the wifi is showing there is no connection ? What can i do please help me MAX…. Hello I am interested in a review on the Lineage 14.1 based on latest Android 7.1.1 Nougat. Thank you! Device boots directly to ODIN “download” mode. Any ideas as to why ? as all instructions were followed. Installed 14.1 and it worked flawlessly. how i can install app on this rom?? whats solotion to fix this ? I can´t download PlayStore…. do u got any idea why ? My phone version is (sm-n900)is it supported? i cant bypass setup wizard the taps are quiet fast.what can i do? Hi Max. Thanks for the step by step guide! I just successfully flashed Lineage OS 15.1 for my Sprint SM-N900P and everything is working fine. I feel like I have a new phone again. I tried the other Gapps, but like you mentioned BeansGapps was the one that worked in the end. I did not need to flash a modem either. Calls, texts, data, GPS and bluetooth are all working fine. Previous story T-Mobile 4G LTE Bands Not Working on Exynos Galaxy S9/S9+!